Why Are Some Businesses Closed on Labor Day? FNUNewsWhy Are Some Businesses Closed on Labor Day? 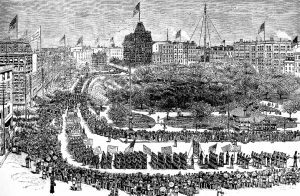 Labor Day parade at Union Square in New York City in 1882. Once again, another federal holiday approaches and most people might only appreciate it for having an extended weekend, not fully understanding the meaning of it all. While Florida National University’s (FNU) campus may be closed on September 5th, we believe that it’s absolutely necessary to educate our students about such observance days, how they’ve come to be, and why we continue to honor them. Labor Day is a public holiday observed in the United States (US) every first Monday of September. This observance day honors the workers who have contributed toward the betterment of the US economy. Labor Day was first recognized during the late 1800s and was founded by the Central Labor Union and the Knights of Labor (labor unions who demanded the eight-hour workday and enforced the values of individual rights, promoting an ideology of a firm commitment to liberty). It became an official public holiday in 1887 in the state of Oregon, but it didn’t become an official federal holiday until 1894. The argument of who initiated Labor Day in the US seems to have never been resolved. Some people say that Matthew Maguire, machinist and secretary of the Central Labor Union of New York, first proposed the holiday. Others argue that it was an American Federation of Labor member and carpenter, Peter J. McGuire who spearheaded the observance day after watching Canada’s annual Labour Festival. At any rate, Labor Day wasn’t official until after the 1894 Pullman Strike. Founder of the American Railway Union, Indiana Senator Eugene V. Debs played a crucial part in the Pullman Strike. He signed many railroad workers to his union when they initiated the “wildcat strike”. The wildcat strike was due to pay cuts and overpriced water and gas rates for people who lived in the railroad town designed by industrialist George Pullman. Once Pullman’s railroad workers signed on to his union, he called a boycott against all trains that hauled a Pullman car. This resulted in delayed mail and back in the 1800’s, that was an extremely big deal since there was no Internet or email to be had. This strike affected 250,000 workers in 27 states. It resulted in the unfortunate deaths of 30 people during riots that had arisen due to this strike. The bottlenecking of postal mail, and the $80 million in damages (an already substantial amount, but in the 1800s, even more) might have been the tipping point to force President Grover Cleveland to send the US Army to prevent Debs’ strikers from stopping the trains. Debs was instructed by the Supreme Court to stop the obstruction of US mail, but disobeyed the order. He was arrested and sentenced to six months in prison. During that time, the Pullman Strike dissolved. After that stint, the United States Congress unanimously voted to make Labor Day a national holiday. This was President Cleveland’s attempt to make a peace offering of the post Pullman Strike in hopes that he would gain support from trade unions. It worked. So Why Are Some Businesses Open and Others are Closed? But we can’t ignore the question of why some businesses close on Labor Day while others remain operational. One might argue that because it’s a federal holiday, workers might get the day off to celebrate their tireless efforts of contributing toward the US economy. On the other hand, since it is Labor Day, others might argue that it’s all the more reason to keep businesses open. Either way, it’s up to the owners if they want to keep their businesses running on Labor Day. However, since it is a federal holiday, you can expect most government-funded operations to be closed that day. Private business corporations might be officially closed, but have a skeleton crew working who may or may not receive overtime pay for working on a holiday. That sometimes depends on the state law, even though it’s federal observation. The retail business is a totally different industry. Again, they certainly have the freedom to close that day, but financially speaking it wouldn’t be the smartest move for them. We know that there are going to be thousands of government workers off and while most of them might want to spend a relaxing day at home, others might want to get out of the house and do a little shopping. Business owners know this, so they will most likely remain open. Shopping malls may not have a choice. Staying open on days like these may be part of their contract. In order for malls to remain successful and keep traffic coming in, keeping their doors open on Labor Day could be mandatory. Strip malls on the other hand, might be a bit more flexible with their tenants, giving them the option to close at their discretion. Labor Day is also unofficially noted as the end of summer, a probable bittersweet celebration for college students who took the summer months off! The beginning of September is when the new school semester is underway, along with fall sports and activities. Depending on where you live, the weather might even change, making it quite obvious that the summer months are coming to an end. For some people, Labor Day serves as that last celebration of summer. Whether you are starting a new college semester, taking your last vacation of the summer, taking the day off to shop, staying at home to relax, barbequing, or maybe all of the above, take the time to recognize why you have the liberty to do all of these things in the first place. The FNU family wants you to enjoy your three-day weekend, but also be aware of your nation’s history. We are dedicated to educating our students on cultural and technical academics. Visit our online catalog to see what type of degree and certificate programs our university has to offer. We are an accredited higher learning institution whose mission is to help you shape your future by equipping you with academic excellence. Contact an FNU representative to for more information about any of our degree and certificate programs today!